Naphthenic base oils work perfectly well in bentonite grease as long as producers make sure that they match the polarity of the oil to that of the bentonite. René Abrahams offers some advice to grease formulators. “When used for the production of bentonite greases, Nynas oils offer several important benefits. 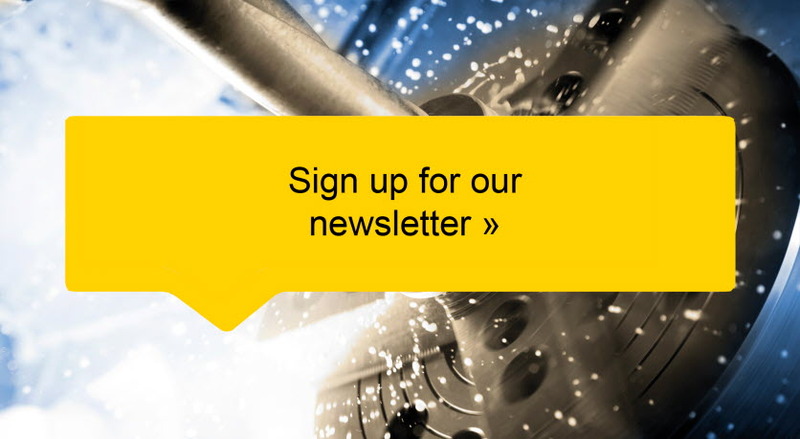 However, formulators need to make sure that they use the correct combination of ingredients in the grease,” says René Abrahams, a Nynas Technical Advisor with special focus on lubricants. Failure to follow her advice can spell problems for grease manufacturers, although they are easily avoided. “Here at Nynas, we are able to offer advice, but first and foremost formulators need to turn to their bentonite supplier for correct information about which polarity is suitable to use with their product,” she explains. An organic clay, bentonite is used as a thickener in grease. Typically used in high temperature applications and applications that involve exposure to water, for instance in ball, roller or plain bearings, bentonite greases must have a high dropping or melting point as well as good resistance to water. Bentonite clay is supplied in an organically modified form, and in some instances, suppliers sell bentonite products suitable for use with products of different polarity. There are bentonite products recommended for low, medium and high polarity. “It is important to match the polarity of the oil with the bentonite, and in some instances a polar activator must also be added to the formulation,” says René Abrahams. Among the benefits of using naphthenic oils for the production of bentonite grease Abrahams mentions good pumpability of the grease in environments where the temperatures might reach -20°C. Formulations using naphthenic oils also offer good production yields compared with grease formulations based on alternative oils. Experiments carried out at Nynas’ “Grease Lab”, a pilot plant facility for lubricant production at Nynas Technology Centre, throw new light on the role of naphthenic oils in bentonite grease formulations, and have enabled René Abrahams and her colleagues to dispel the misconception that naphthenic oils are unsuitable for use in such grease. Nynas T grades are recommended base oils for grease formulations, and for bentonite grease production, a thickener system for use with oils of medium polarity is advised. 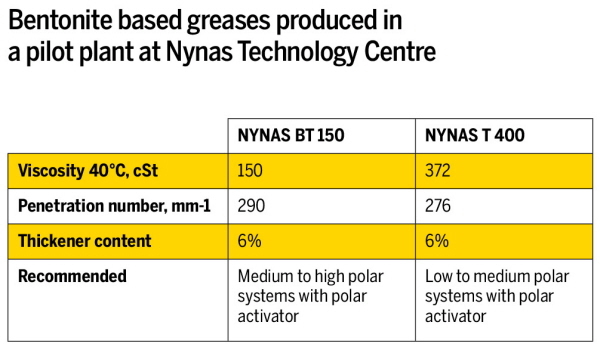 For instance, a base grease, without additives, can successfully be produced using Nynas BT 150 oil. To achieve an NGLI Grade 2 grease, the addition of around 6 percent of thickener is required. The same production yield can be achieved with Nynas T 400. However, in order to do so, a different bentonite product needs to be used. The quality of the bentonite product will also impact on the production yield. Bentonite of a poorer quality would require an increased amount of thickener. René Abrahams is an analytical chemist with extensive experience of the downstream oil industry. She joined Nynas’ Technical Development and Market Support department in 2011, and is currently based in Singapore as Technical Advisor for the APAC region focusing on lubricant applications.